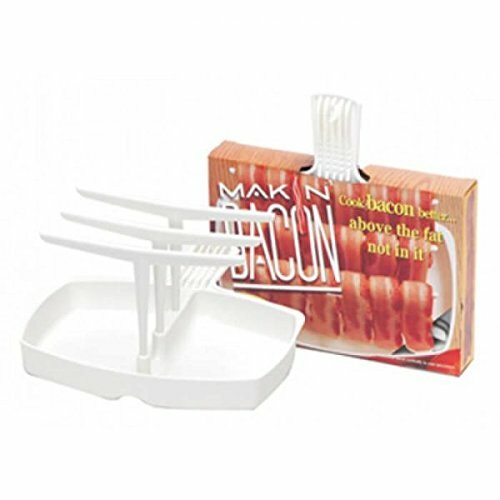 Microwave Bacon Cooker Tray - The only way to cook bacon! This microwave bacon cooker cooks the bacon in the air and not in the fat. Simple and easy to use - hang the bacon over the bars, place one sheet of roller towel over the bacon and into the microwave. With the right amount of time you have crispy bacon with up to 35% less fat. Instructions: 1. For one to six bacon strips, use on drip bar at the center> -For 7-12 bacon strips, two drip bars at the front and back -For 13-18 bacon strips, use all three drip bars. 2. Drape bacon strips over each drip bar. For best results, distribute bacon strips evenly on the drip bars 3. Place a paper towel over the drip bars to control splatter. 4. Place the MAKIN BACON dish in the center of the microwave. Cook bacon on high power 1/2 - 1 minute per strip. 5. Remove bacon from drip bars and pour bacon fat from the dish (at the corner). Enjoy the easy access to fresh, perfectly cooked bacon! If you have any questions about this product by Camerons Products, contact us by completing and submitting the form below. If you are looking for a specif part number, please include it with your message.